As the flagship of Dell’s color laser printer lineup, the Dell 5100cn stands out as one of the most impressive workgroup color MFCs available, even though it was released all the way back in 2004. The unit’s specifications don’t lie, though it is a bit bulkier than color laser printers than you would find on the market today. 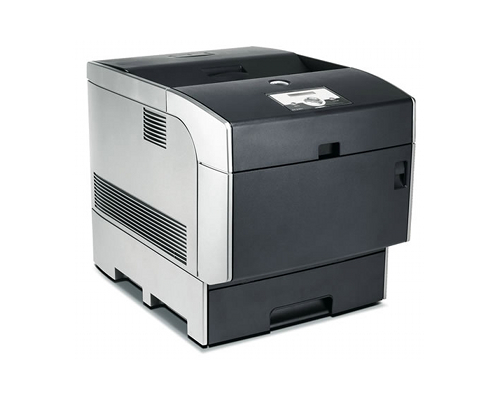 With print speeds of up to 35 pages per minute in monochrome and up to 25 pages per minute in color, the Dell 5100cn can compete even with professional grade color copy machines for raw speed. This is made possible due to a beefy 400 MHz processor than handles the complex four color printing tasks demanded of this unit. The Dell 5100cn’s maximum monthly duty cycle of 90,000 pages insists that the device can take plenty of abuse, and is more than suitable for network use. Networking is made standard with the device, which is to be expected for a business class machine that once sold for just under a thousand dollars. Standard print resolution rests at the usual 600 x 600 dots per inch, but true 1200 x 1200 dot per inch mode is selectable at only a one half reduction in speed which, for a unit this fast, may be worth the wait. Standard paper handling for the machine consists of a 500 sheet paper drawer and oversized 150 sheet multipurpose tray, which we often see in color devices from this era. Additional paper trays with 500 and 1000 sheet capacities can not only be added, but both can be used simultaneously to create a machine with a grand total of 2150 sheets of storage space. Really one of the only major drawbacks to this unit is that it shows its age, literally. It is bigger and bulkier than newer color laser printers, and a whole lot heavier. This enormous beast weighs 77 pounds and has dimensions of 18.2 in. x 16.8 in. x 22.9 in. (W x D x H) and is therefore so big that it may actually cause a problem in a small office. The other issue with this machine is that it was truly within the first generation of high powered color laser printers, and therefore had an original price tag of $999 dollars. It would be very difficult to say what one of these would go for today if one were to discover one new, and finding spare drum units for the device may prove difficult. There is an option for a 20 GB hard drive but, if one considers the original price of this workhorse, it seems only fair that they should have included one. 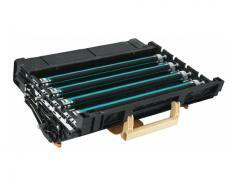 Review it: "Dell 5100cn "
The Dell 5100cn operates using a drum unit and four individual color toner cartridges. 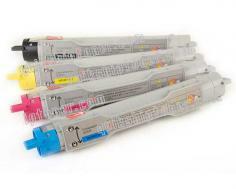 Third party manufactures produce all four colors which range, depending on the brand, around the 8,000 to 9,000 page yield range at 5% coverage. The drum unit is capable of a 35,000 page yield, but made be difficult to find new due to the age of the printer itself.